In the blink of an eye, it was over. Justin Timberlake may want to take notice. Cpl. 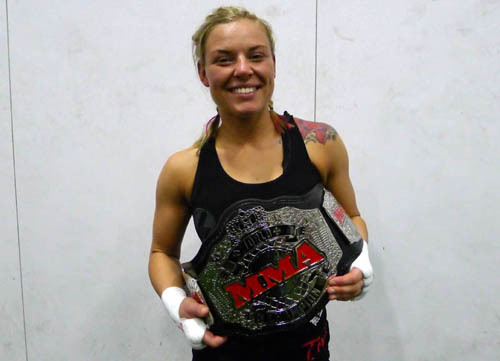 Kelsey De Santis, the Marine who famously invited the singer and actor to attend the Marine Corps birthday ball with her, competed Saturday night in Operation Octagon XVI, a mixed martial arts event in Sterling, Va.
To say it was a one-sided fight would be an understatement. De Santis, fighting in the 145-pound featherweight title fight, pummeled her opponent, Stacy Sneeringer. With a flurry of energy, De Santis took Sneeringer to the mat early, and finished her off 2:51 into the fight with a series of punches and elbows to the face. The match never made it to Round 2. As you can see, the 5-foot-9 De Santis had a large following in the crowd of about 300 people. She took the the microphone in the ring afterward and thanked a variety of people, including her coaches and fellow Marines at the Martial Arts Center for Excellence in Quantico, Va. She also acknowledged all the hoopla surrounding the sensation her YouTube invitation created. On came one of his signature songs, “SexyBack,” and the crowd cheered. Way to go Cpl De Santis! Semper Fi! Kelsey I’m am a big fan. You are going be a star! Good day very cool site!! Guy .. Beautiful .. Amazing .. I’ll bookmark your website and take the feeds additionally?I am happy to seek out a lot of helpful info here within the put up, we want develop more strategies in this regard, thank you for sharing. . . . . .